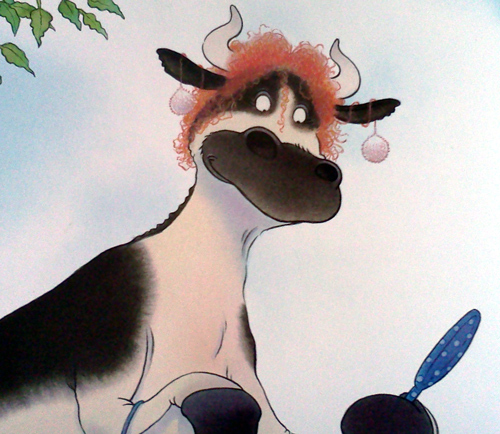 Today’s cow is wearing… a wig? 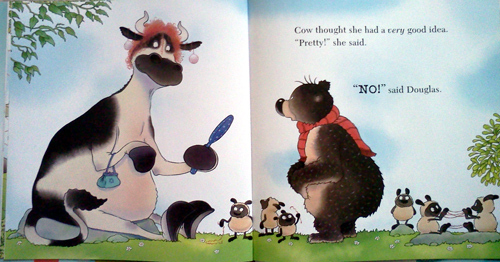 I found today’s cow in a children’s book called Don’t Worry, Douglas! 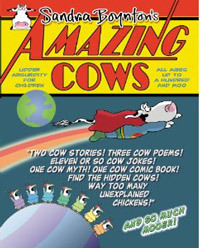 by David Melling, which we recently borrowed from our local library. 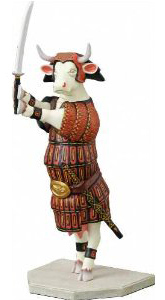 Of course, this book about a bear wouldn’t be complete without a cow. She shows up right after the sheep. Look at her. Doesn’t she look pretty? I love the pompons dangling down from the ears. And if you’re wondering what happens to Douglas’s hat, it doesn’t get turned back into a hat (at least not by the end of the book) and Douglas is worried his dad will get upset. But instead Dad gives him his own hat to wear and keep warm. Dad clearly hasn’t learned his lesson!